Plastic Summer House - Who Has The Best Plastic Summer House? A plastic summer house may not have the traditional elegance or classic looks of a wooden summer house, but they can be much more practical buildings. Put simply, they’re typically tougher and more durable than their wooden counterparts, and are virtually maintenance free. They can also be much quicker to install, which is an important consideration for those whose time is precious. It’s no wonder that they’re starting to gain in popularity, which is why we’ve created this handy guide to help you find your perfect plastic summer house. Whilst not as widely available as wooden summer houses, we were pleased to find five high quality examples worthy of a place in our league table. We then looked at the cost, size, and value for money of each building, as well as the aesthetic appeal which is so important in a summer house. The vast majority of summer houses we review are made of timber, so what defines a plastic summer house? It has to have enough room inside to make spending time in it a comfortable and welcoming experience, rather than being built purely for storage purposes. It also has to allow a good supply of natural light inside, and to have a stylistic flourish that elevates it above a standard plastic shed. Whilst plastic summer houses are still very much a niche market, we were pleased to find five unique models that all met our criteria and were therefore worthy of a place in our league table. Selecting a winner in such a diverse category was a difficult task, so it’s very well done to the 15 foot by 8 foot Lifetime summer house. 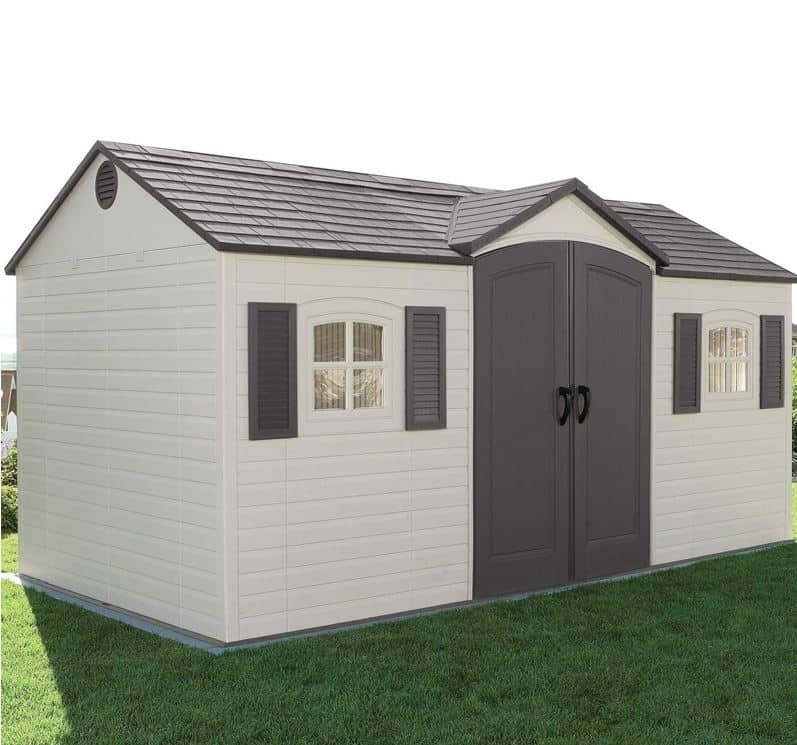 Thanks to its highly attractive design, spacious interior and excellent value for money, it earns the accolade of being the best plastic summer house that can be bought online in the UK today. 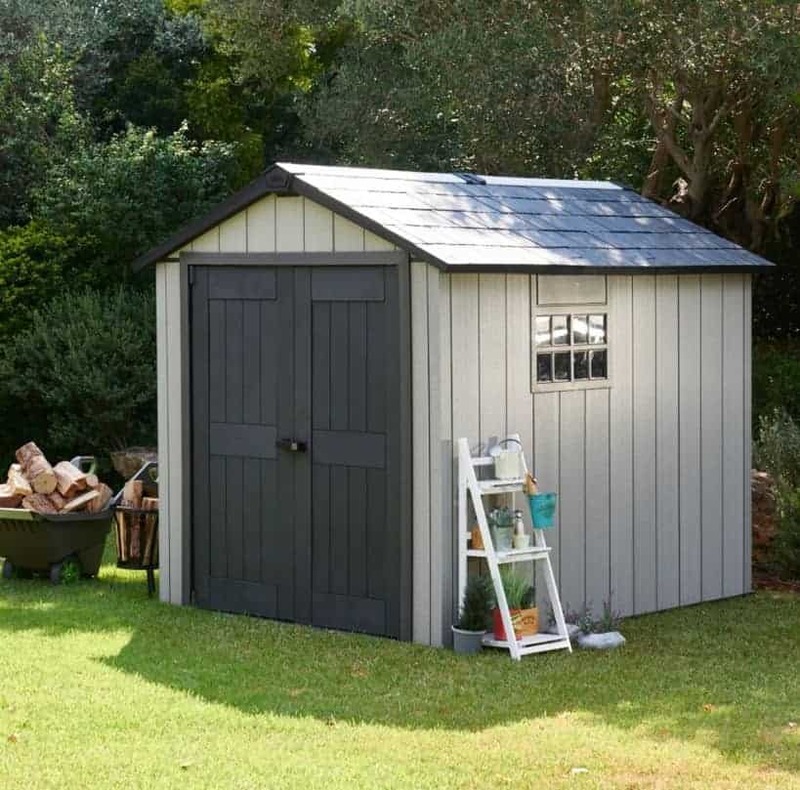 Whether you want summer houses or green houses, or anything in between, the independent reviews from WhatShed can help you make a smart purchase. 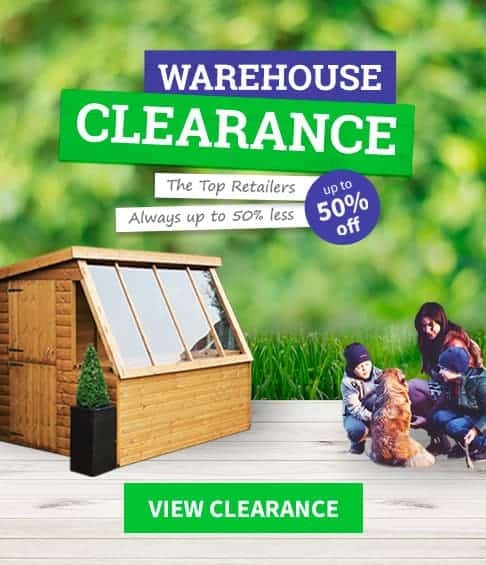 This eye catching plastic summer house from Lifetime is one of the largest we’ve reviewed, and yet it’s only the third most expensive in this WhatShed top five guide. This winning combination of good looks, large dimensions, and superb value for money takes it straight to the top of our league table. Its asking price of less than two thousand pounds looks even better value when you consider that it comes with a 10 year manufacturer’s guarantee. 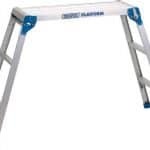 With heavy duty components being used throughout as well, as for example the use of high-density polyethylene reinforced with a galvanised steel frame, we wouldn’t be at all surprised to see it last much longer than the warranty period exists. 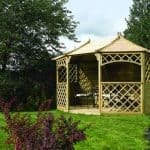 Many people miss out on the advantages that a plastic summer house can bring simply because they don’t believe that they will enhance the visual appeal of their garden in the way a wooden model will, but we found this a very attractive building. The contrasting white and dark grey is simple and yet striking, and we were particularly drawn to the wide and large double doors at the centre of the summer house. It makes it easy to move furniture in and out, and with a fifteen by eight foot interior, there’s a lot of room to relax in. When it comes to plastic garden buildings, Grosfillex are noted for both their durability and their original and attractive designs. 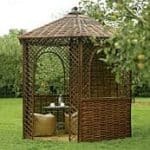 We were pleased to find that they had met both of these criteria with their twelve foot by ten foot plastic summer house. 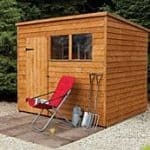 Stylistically it resembles many of their plastic garden sheds, with a reverse apex and a shade giving overhanging roof, but the extra space available inside transforms it into a summer house environment that’s ideal for use as a place to work in, a place to relax in, or a place to entertain guests in. One of the things that made this plastic summer house stand out at first sight was its attractive colour scheme, with white contrasting with a pastel shade of views. That’s one of the many advantages this holds over traditional timber summer houses, it doesn’t need painting and of course it won’t need any wood preserver adding. We were also pleased to see a ten year manufacturer’s guarantee included, which is a welcome feature that’s common to all five models in our league table. We were also struck at first sight by the height of this building, with a ridge height of more than eight foot and an eaves height of over six foot. It means that it should feel very roomy and comfortable inside, and light as well thanks to the glazed double doors and the two side windows. This is a stablemate of our table topping plastic summer house, but on a smaller scale. Even so, the base dimensions of approximately ten foot by eight foot mean that there’s lots of space to utilise in the interior, whether for work, as a home office, or leisure purposes. 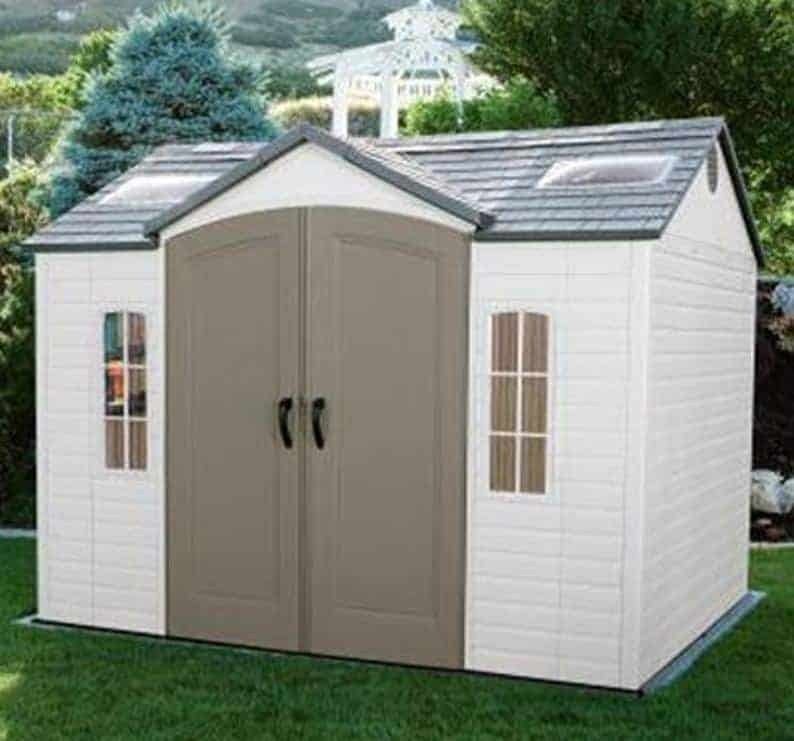 Whilst it also comes with a lower price tag, this time just under fourteen hundred pounds, we feel that the larger scale summer house does offer slightly better value for money, which accounts for their relative positioning. Once again we were impressed by the very accommodating and centrally positioned double doors, and this time they dominate the overall appearance even more, as there is less building on either side of them. The windows are narrower here too, although we did find them stylish thanks to their arched top. Thankfully that shouldn’t impact on the natural light inside this plastic summer house, as there are two light giving skylights towards the summit of the apex roof. Another feature we were pleased to see on this summer house was the inclusion of shelving units as standard. That could be used for storage purposes, of course, but we can just as easily imagine it being used to stand speakers on for a sound system, or decorative items that enhance the visual appeal of the interior. If you’re looking for a very large interior area as well as a very stylish exterior, then this plastic summer house from Grosfillex should tick all the right boxes. 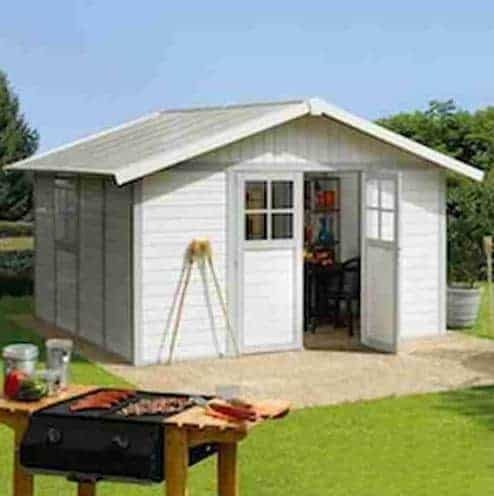 The sixteen foot by thirteen foot base size makes this by far the largest of the plastic summer houses we’ve reviewed, and that makes it an ideal garden building to use for dual or multiple purposes. There’s enough space inside to use one area as a home office, while using another area as a games room, gymnasium or simply as a place to entertain guests before or after a dinner party. It’s this versatility that gains this summer house a place inside our top five league table. We always like garden buildings that have a look of their own, and once again this plastic summer house delivers. There’s lots of glass, both on the double doors and on windows to the front and side of the building, so there’s plenty of natural light to see by. We were also impressed by the L-shaped design which creates a natural porch under the overhanging apex roof, as well as by the side personnel door that makes getting in and out quick and easy. This would have been placed much higher but for its elevated price tag, so if this falls within your budget then you may want to make it your number one choice. This is unlike any other plastic summer house to feature in our league table for two reasons: its size and its fabrication, but both of these also bring benefits that help it secure the final place in our guide. At approximately seven foot by nine foot this is easily the smallest garden building here, and yet with a high apex roof that has a peak height of 2.42m it should still feel quite spacious inside. With a good amount of light coming by way of side windows and a centrally positioned skylight, there should also enough light inside to work by or to relax and read a book. 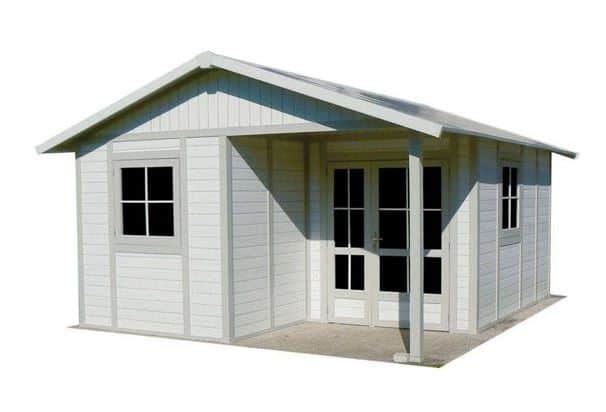 The other unique attribute of this good looking and compact plastic summer house is that it is made of double wall plastic resin with a steel reinforcement. 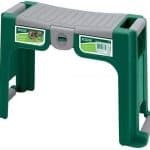 That means that it should feel strong and stable once assembled, and so will be a good choice for people whose gardens are in an exposed area or often subject to strong winds. 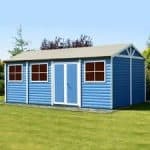 We also feel it’s worth considering by those who want the versatility of a summer house but don’t have a lot of lawn space available on which to site one, and its asking price of less than a thousand pounds makes it accessible and affordable. Hi Bill, if you want more flexibility with how you want things constructed then I think you would be better off going for a pressure treated wooden summerhouse. The plastic ones are quite restrictive in how they are made. Is it possible to have a utility summer house custom made. Yes but its very unlikely if you want it made in plastic.